I haven’t had guest bloggers on Rasa Malaysia for a while, and am very happy to have Trissa of Trissalicious as a guest writer today. Trissa is one of my recipe testers and certainly one of the most trusted ones (thanks so much for your help!). Her passion in food can be seen on her gorgeous food blog Trissalicious. In this post, Trissa shares a classic Filipino recipe—Shrimp Sinigang. I have always wanted to learn more about Filipino cuisine, and Shrimp Sinigang is very high on my list. Imagine big, fresh, succulent shrimp swimming in a savory, sweet, and sour broth…the thought of it instantly sets my mouth watering. Please give your warmest welcome to Trissalicious. Sinigang is a soup whose flavor is soured with fruits abundant in the Philippines like tamarind, guava, green mangoes or bilimbi (kamias). 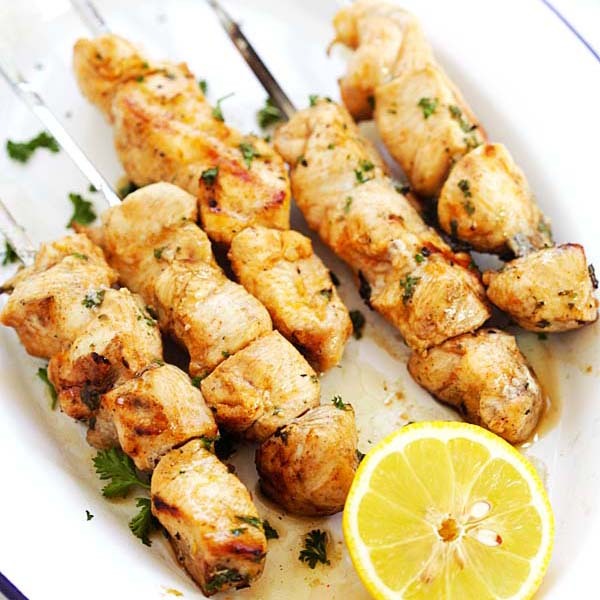 The dish is easily adaptable depending on what protein is on hand, but most frequently made with pork, beef, or prawns. The soup is also rich in vegetables that are easily available in the Philippines like daikon, eggplants, snake beans and water spinach. Despite sinigang being one of my favorite comfort foods, I’m embarrassed to admit that I’ve always used a mix to make it. Every time my parents visit from the Philippines they bring me a care package which includes packets of “instant sinigang mix”. So it was definitely with a mix of excitement and apprehension that I attempted this dish from scratch. To create that signature sourness I chose tamarind. As a fruit it is quite difficult to come by overseas but tamarind pulp is readily available in Asian groceries. To make the base of the soup, tamarind pulp is soaked in hot water for a few minutes and then mashed, strained and added to the pot. Sinigang is never complete without a bowl of steaming white rice and what we refer to as sawsawan, a dipping sauce made with fish sauce, calamansi and a bit of chili. Together, with the rice, you have a complete dish. I am grateful to Bee for giving me this opportunity to share with you a dish that is distinct to the Filipino palate and yet appeals to everyone else. What started out as a quest to create sinigang from scratch has made me more proud than ever of my wonderful cuisine. 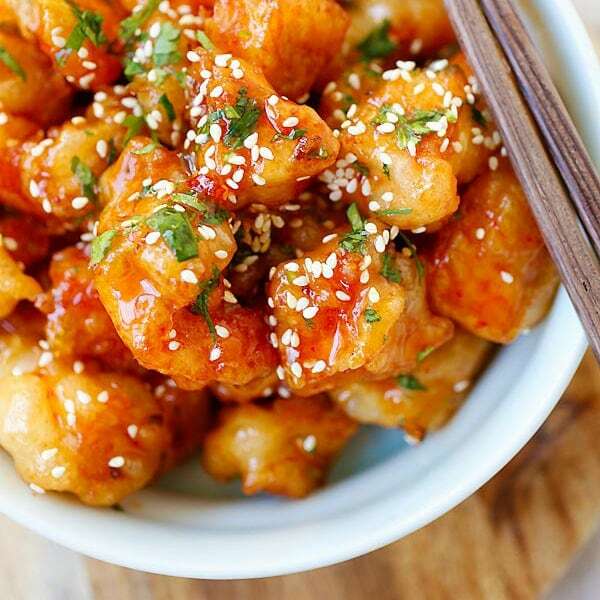 Sour, salty, with a hint of sweet and bitter… this dish takes me back to the Philippines every single time. 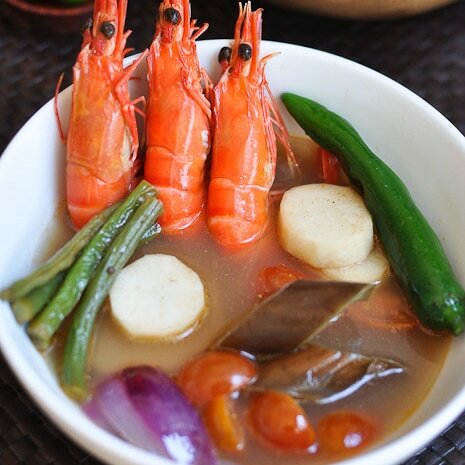 Shrimp Sinigang (Sinigang na Hipon) Recipe. Heat the vegetable oil in a deep pot and sauté the red onion, tomatoes and green chili for two to three minutes. Strain the tamarind pulp into the pot and add the rice wash. Bring this to a boil and then turn down to a simmer to cook the vegetables. For the vegetables, add them to the pot according to how long they take to cook. Add the vegetables that take longer to cook first. As an estimate, the snake beans will take around 7 minutes, the daikon and eggplant around 5 minutes and the water spinach around 3 minutes. Once the vegetables are done, add the prawns which should take only around 3 minutes or so to cook. Finally, add the fish sauce and sugar and adjust the seasoning to your liking. OMG, look at those big prawns, I love anything with prawns. It reminds me of Thai Tom Yum Goong, I wonder if the taste is similar? Frankly speaking, I know very little about philippino cuisine and I have not heard oc this soup! What a great collaboration from my two favourite blogs :) this soup is full of wonderful ingredients and I can wait to try it. Can I use other eggplant? Not sure what is Japanese eggplant. The daikon looks like fish balls. I thought they were fish balls. Seems easy to make. Gorgeous Sinigang, just looking at it is making my mouth water! Thank you again Bee for giving me the opportunity to guest post! I really enjoyed making sinigang from scratch and my family did mention that they loved it and would never go back to instant mix again! Love Trissa blog too! Great choice. And glad that she is also one of the recipe tester! Mmmm…looks delicious! Can’t wait to try at home. Just a question about the green chili. What kind do you use and do you saute whole (not sliced/chopped) with the red onions in tomatoes in step 1? With this kind of recipes I don’t mind being your recipe tester either. I love food from different culture. I will defiantly try this. This recipe sounds so so interesting. Looks fantastic also. Rice wash, love that! Thanks Trissa for this recipe! I have never heard of this dish until now. Love how you share the food of the Philippines with us, thank you. The prawns looks big and juicy and the dipping sauce is right up my alley…love fish sauce! Wow this looks REALLY good. 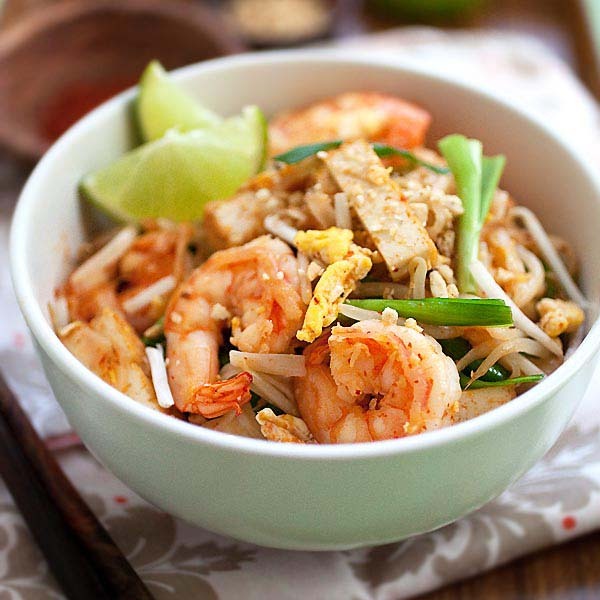 It’s high time I get my hands on some tamarind and head-on shrimp and give this a go. This is definitely one my most favourite dishes from home. Sadly, I don’t make it very often because I just can’t seem to get the right balance of flavours so I always end up disappointed with. My sister makes a real wicked pork version of sinigang, I miss that. I love prawns to the extend that I have to carry anti-histamine with me just in case I get the bumps! This dish look so inviting.. I am now curious about the taste. thanks for the recipe! It makes me realize how little i know about filipino food. It looks delicious. Now i want to learn more. Beautiful post! It’s so interesting; I think this soup has quite a few variations in South East Asia. The Vietnamese also have their own version (one that I’m familiar with) and it too makes use of tamarind, fish sauce and so on. The basis is also seafood -great with the lovely citrusy sour notes. How wonderful it is to see both striking similarities and personal touches amongst different cuisines. Sugar in sinigang? This is quite unheard of from our province. the picture of the shrimps/prawns are lovely. I will be cooking this recipe for the first time. wish me luck! the picture really looks sumptous..however, i agree with Lexa i have never heard of cooking sinigang with sugar in it. Also, oil is never an ingredient for sinigang. Everything is just boiled and not sauteed. Interesting version of sinigang, I never tried sautéing and adding sugar to my sinigang. can u recommend a filipino restaurant in KL. Please please please tell me where you get tamarind pulp?!! Is it frozen? I only have tamarind concentrate on hand. how much should i sub for the tamarind pulp? I’ve never heard of adding sugar to sinigang. Also, have never used tamarind in sinigang na hipon [that’s usually reserved for Sinigang na Baboy (Pork) or Sinigang na Baka (Beef)]. Our family traditionally uses bayabas (guava) for seafood sinigang. For the veggies, sinigang always has kang kong (water spinach) and the ones using meat always has gabe (taro). Thanks for your feedback. 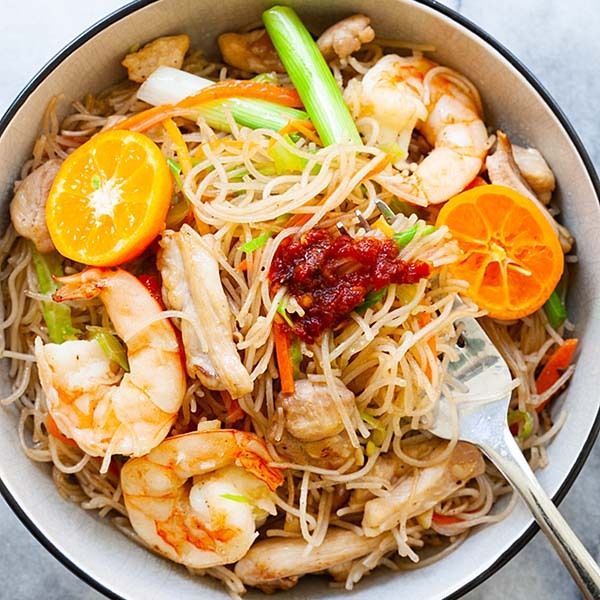 This recipe is by a guest blogger who is a Filipino.